A new kelpie-sized dinosaur has been identified in the Lightning Ridge opal fields, 100 million years after it roamed prehistoric floodplains. 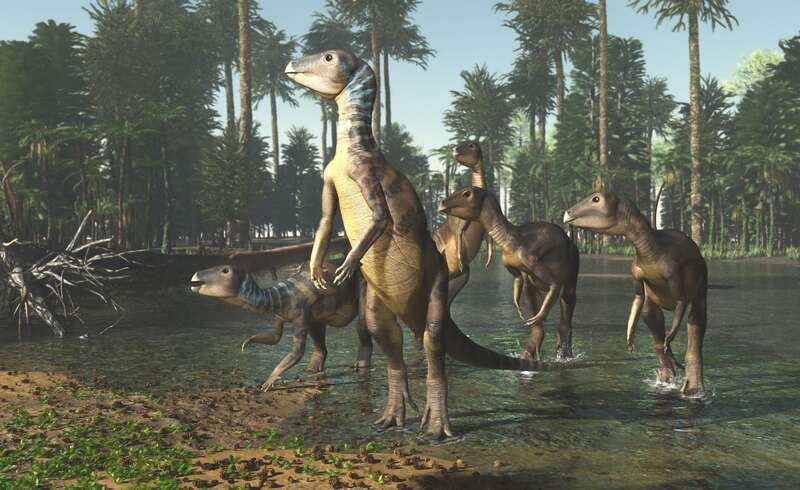 Image: Weewarrasaurus pobeni. Image ©James Kuether. A new dinosaur has been added to the more than 700 already named after a chance discovery of a jawbone fragment in a bucket of opal rubble from near Lightning Ridge, New South Wales. The kelpie-sized reptile, which lived in the Cretaceous Period about 100 million years ago, has been dubbed Weewarrasaurus pobeni – a name that recognises the fossil’s unearthing in the Wee Warra opal field, and honours Mike Poben, an Adelaide-based opal buyer who donated the specimen for research. It is the first new dinosaur to be named in NSW in nearly a century. Weewarrasaurus was an ornithopod dinosaur, part of a group of small plant-eating species that moved around on two legs and that were particularly abundant on the ancient floodplains that covered the region 100 million years ago. Like all fossils from the Lightning Ridge opal mines, the lower jaw—the only piece of the animal recovered—is preserved in opal. Precious opal gives off a rainbow of colours, in this case shimmering green and blue. Lightning Ridge is the only place in the world where dinosaur bones routinely turn to opal. Palaeontologist Dr Phil Bell from the University of New England in Armidale, who led the research, said, “I remember Mike showing me the specimen and my jaw dropped. I had to try hard to contain my excitement, it was so beautiful”. Although only the lower jaw of the new animal has been identified so far, even that might never have been found if it were not for Mr Poben’s keen eyes. Dr Bell regards Lightning Ridge as a world-class fossil resource because it preserves a unique suite of Cretaceous fauna. “If these fossils were in surface rock, like those found in China and Mongolia, it would be an absolute treasure-trove,” he said. Jenni Brammall, palaeontologist, gemmologist and manager of the Australian Opal Centre in Lightning Ridge, describes the jawbone as “a supremely rare and unlikely discovery”. "This incredible little object is both the 100 million-year-old jaw of a new dinosaur species and a precious gemstone," she said. The Weewarrasaurus jaw is now part of the Australian Opal Centre collection, the world's most diverse public collection of opalised fossils. The research was published today in the scientific journal PeerJ.